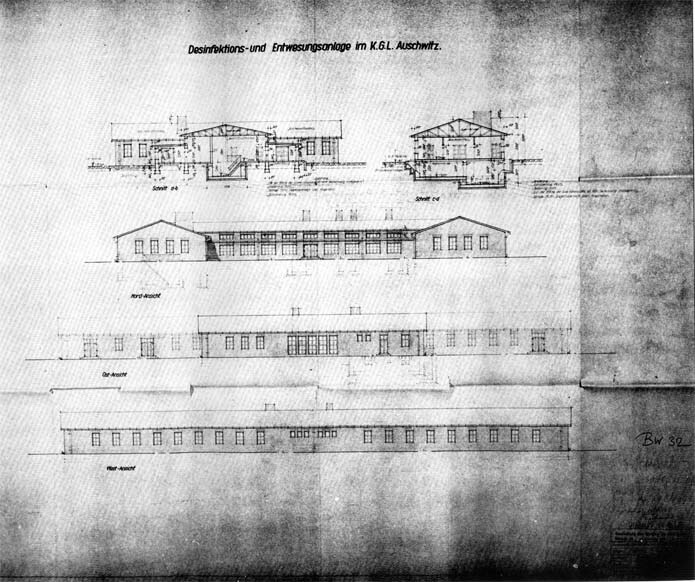 Drawn by prisoner 538 on 1/3/43, checked by Dejaco and approved by Bischoff on 2/3/43. checked by Dejaco and countersigned by Bischoff on 8/3/43. The cross section a-b does not show the additional pressure vessel installed. The four chimneys for the hot air disinfestation chambers and the collective one connected to the basement boiler room producing hot water for the central heating and showers and steam for the three autoclaves are perfectly visible. In the right hand corner of the drawing, handwritten in red is “Geprüft / checked, 14th July 1943. No. 34142/43” with a date. 16th August 1943 and the signature of Teichmann, a Bauleitung civilian employee.